The PUD supports the protection and efficient use of natural resources in Whatcom County. Water resource management or water supply planning can help increase water efficiency, promote water conservation, and enhance source protection. The PUD works with local and federal governmental including regional entities to develop solutions for effective water resource and supply management practices. Under a grant received by the PUD, from the State Department of Health, Dave Olson (Cornerstone Management) worked with the State DOH, State Department of Ecology, Whatcom County Health Department and property owners in the south Lake Samish area to complete a study to determine best options for bringing water supply to residents in the south Lake Samish area. Due to file size, the study has been divided into sections. The first forum on water resources and water rights from a county-wide perspective. PUD General Manager Stephan Jilk participated on the panel along with other five others to answer the questions: What are the major issues with water supplies and uses in Whatcom County? And What would a comprehensive and reasonable solution look like? Click here to view the video. Pictured is a farm located in the foothills of Mt. Baker. 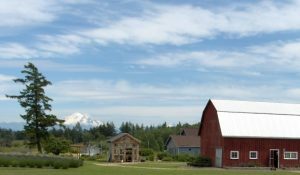 The Washington State Department of Health has determined that twelve community water systems in North Whatcom County were out of compliance with Drinking Water standards because their ground water supplies exceed the maximum contaminant limits (MCL) for nitrate and/or ethylene dibromide (EDB’s). To assist these community water associations, Public Utility District No. 1 commissioned a two-part North Whatcom County Regional Source Feasibility Study which was funded by the Department of Health. Part 1 of the Feasibility Study is now complete. Click here to view or download the study. 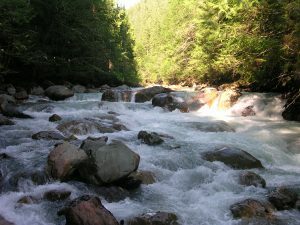 Pictured above, spring flow on the Nooksack River. The WRIA 1 Watershed Management Project brings together citizens, local governments, tribes, and state and federal agencies to develop plans for allocating water, protecting water quality, and restoring fish habitat. Located in northwest Washington, Water Resource Inventory Area No. 1 (WRIA 1) encompasses the surface and ground water in the Nooksack River basin and certain adjacent watersheds. Public Utiliy District No. 1 is one of the initiating governments of the project along with Whatcom County, City of Bellingham, Lummi Nation, and the Nooksack Tribe. Nooksack Source Protection Plan (NSPP) – The Nooksack Source Protection Plan was developed by the City of Lynden and Public Utility District #1 of Whatcom County in accordance with WAC-246-290-135 (4) and WAC-246-290-668. For purposes of preparing the NSPP, the Nooksack Basin is divided into its four primary subbasins: North Fork, Middle Fork, South Fork and Lower Nooksack. The focus of this document is on the areas above the City of Lynden and PUD water intakes. The City of Bellingham operates a diversion dam on the Middle Fork of the Nooksack River. Information about the City’s diversion and land uses above and adjacent to the diversion are included in the NSPP. The City of Bellingham and Lake Whatcom Water & Sewer District have jointly prepared a source protection plan for the Lake Whatcom watershed. The two source protection plans – the NSPP and the Lake Whatcom Source Protection Plan – together represent a regional source protection effort for the Nooksack Basin.